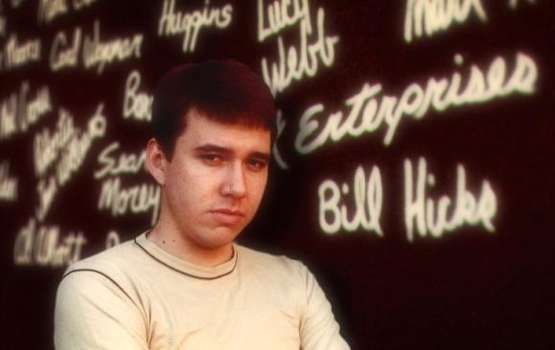 The problem with making any sort of documentary effort on life and work of the late, great stand-up comedian Bill Hicks is that the storyteller has to compete with Bill Hicks. Even more than 15 years after his passing, just the sound of his forceful, knowing southern drawl still commands the stage. Anyone who tries to put quotes around the experience or draw a coherent line from one part of the narrative to other is bound to be in direct competition with Hicks' voice. And Bill Hicks will win that fight every single time. I can't put up too much of a fight with a project made with so much obvious love. However, my only real complaint with the filmmaker's style is that they fill in the spaces between film clips of Hicks' standup with awkwardly animated photographs that illustrate whatever scene is being described by the interviewee. The actual talking heads of the people we've been listening to the entire movie aren't shown until (spoiler alert) Hicks is diagnosed with pancreatic cancer. This an heir to the throne of the Ken Burns Effect of slowly zooming in or panning from side to side on still photographs to simulate movement. Burns' The Civil War documentary series employs this effect, but in a far less jarring way than is presented here. Normally, this idea of making still photographs come to life through the use of cutting and pasting and quick background movements is only used sparingly when one doesn't have any ready video footage of the subject at hand. Here it is used liberally and ad nauseum. Besides, the radical, confrontational ideas that Hicks spouts are more than enough action for me. That's probably why the parts that I enjoyed best were just the clips of his stand-up, most of which I've already seen. And that's a more powerful statement than anyone else could make about him, no matter how well intentioned: his words can still cut glass after all this time.